I read this book like a ravenous wolf. I read this book in a doctor’s office, with sunglasses on and a chemically dilated right eye due to a corneal infection. It hurt to read this book. But man, it was so worth it. This book is post-apocalyptic fiction at its best. As is typical of this genre, this book begins with an Event which kills most of the people on the planet. Detailed specifics of the Event are never given, but referred to as the “Russia Report,” a phenomenon that involves people suddenly attacking and killing other people before killing themselves. Before each attack, the person reportedly sees Something that disturbs them so deeply that they are driven to madness. It spreads across the Bering Strait from Russia and pretty soon the entire country’s population is decimated. The only way to protect yourself from the Something is by keeping your eyes closed. The main character is a young woman named Malorie, whom we learn is hiding in a house somewhere in suburban Michigan with her two young children. The kids have never seen the outside world. Malorie has trained them to hear all kinds of sounds, because they are to be her ‘ears’ as she travels with them to a safer place. They must go by boat, and they must all be blindfolded to avoid seeing the Something that will drive them to madness. I did love this book, however. There is an ever present dread throughout the story that begins from the first few pages and doesn’t stop until the end. How far would you get in a post apocalyptic world without relying on your sight? The scare factor here isn’t in what you’re seeing, it’s what in the dark around the corner. Or in broad daylight, behind your shoulder. Or sitting right next you. Oh well. You get the picture. I won’t give away any more of the book here. 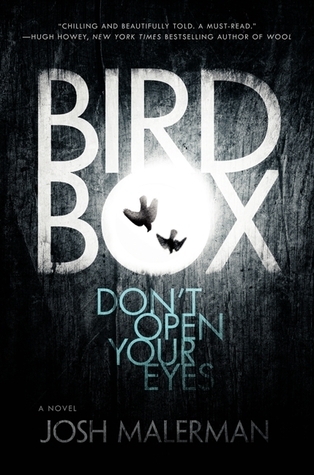 I won’t even tell you why it’s called Bird Box. But this is a hell of a book, and I heard its recently been greenlit for a movie version. Yay! But definitely DO read this first. Great writing debut by a first time author, a must read.